If you live in Washington, DC, please join us in supporting the Urban Agriculture and DC Food Security Bill of 2014. The legislation is moving through the City Council this month, and your voice is needed! 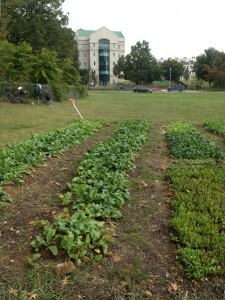 DC City Council Member David Grosso, who spent time visiting the Garden at 391 last April, introduced this legislation, with the idea of building on the legacy of the urban farming act of 1986 and the DC Healthy Schools Act of 2010. This bill takes those initiatives a step further by opening up more public and private land to grow healthy food. Passage of the Urban Agriculture bill is very important as a way to develop local food growing capacity. Gail Taylor, the farmer of the lower field at the Oblate headquarters in Washington, DC has been building the soil and productivity on the city plots that make up Three Part Harmony Farm for the last 3 years, but she and her fellow farmers need these policy changes to take the next step to really grow (in so many different ways!). Please get involved in this brief grassroots effort to make sure the City Council knows how important this issue is to residents of DC. Contact the Chairman and members of the DC City Council Finance and Revenue Committee. They are currently in the mark up phase of the bill. I’m calling/ emailing to let you know that the D.C. Urban Agriculture and Food Security Act of 2014 is an important piece of legislation for our city and that I hope it will be passed soon. • The Act encourages private, District landowners to lease their land for agricultural purposes and encourages urban farming on unused city owned land in response to problems of blighted property. • The Act responds to the District’s continued struggle to address chronic hunger amongst residents with a local solution: encouraging urban farmers to donate a portion of their produce to District-based food banks and shelters. • The Act enables urban farmers to sell their produce both on and off the leased land, bringing easy, fresh food access to neighborhoods across the city, including those currently identified as food deserts. The Spring/Summer 2014 issue of JPIC Report is now available on line as a PDF. It will soon be available in print form. Please contact Mary O’Herron in the JPIC Office if you want to be added to the mailing list.